A nice animation of how a "D" valve works with a good explanation can be found at the Reliable engine site at the "Steamboat Primer" page. Here you'll find a nice description of how a condensing system conserves and recycles boiler water as well as the basic difference between fire tube and water tube boilers. The single cylinder engine animation is from the steamboat@rya-online animations page and I acknowledge the copyright of Bob Shearer, its creator. 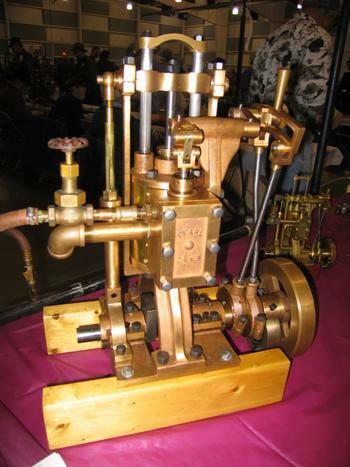 If you are looking for a finished new one-cylinder steam engine be prepared to spend from about 2500 to 6000 dollars (US). Used small one-cylinder engines run from about 500 to 3000 dollars. Of course the price can be much more if you want a “collectable” antique. Casting sets run from about 400 to 1500 dollars plus another 100 dollars or so for other materials. Plans for scratch-built engines run from $50 or less to $200. New small single cylinder, double-acting engines are available from quite a few suppliers as finished and tested engines, machined parts needing Assembly and painting, or casting kits. All the companies below are also linked on the http://www.Steamboating.org web site. 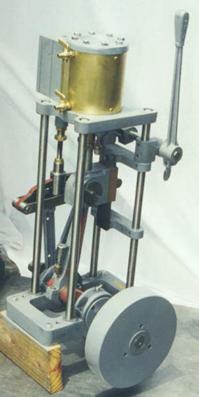 Most offer Stephenson reverse mechanisms. For your first boat I recommend an engine of 1.5 to 4 hp for hulls of 15-18 ft and 4 or 5 hp for hulls from 18 to 22 ft. I would search for an engine of 2-4 hp for my first boat. A five hp is nice for boats of 20 to 24 feet but requires a bigger boiler and a bigger footprint for the propulsion machinery. 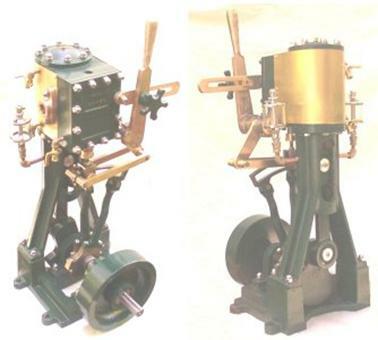 The Beckmann Boatshop (http://www.steamboating.net/page50.html) distributes three 2 hp single cylinder double-acting engines, the Block, Pearl and Murray (slip eccentric or Stephenson reverse) engines. These are available as finished engines or castings. This firm also offers a number of 5 hp engines. The Block is shown below it is advertised as “small and light.” It has a crosshead-driven water pump. Pearl Engines (www.together.net/~pearleng) offers an inverted 2 hp one-cylinder engine in either bronze or cast iron (inverted engines have lots of open movement and the ability to have most of its components lubricated and adjusted easily topside and in plain view). Finished engines, machined engines (need assembly and finishing) or casting sets are available. These engines all have a Stephenson reverse. 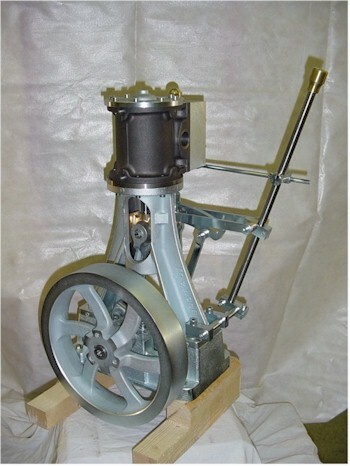 Tiny Power (http://www.tinypower.com/) offers casting sets for a robust “M” 5 hp single, with a Stephenson reverse. Side or center crank “M” units are available. This is a larger engine suitable for boats 20-23 feet. 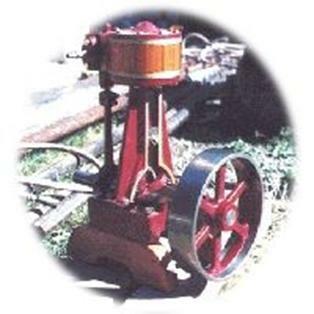 Reliable Steam engines (http://www.pioneer.net/~carlich/index.html) offers a 4 hp single with either a slip eccentric (as shown below) or Stephenson reverse. This is a recently designed engine. Crescent Marine Steam (http://www.cabinfeverexpo.com/Crescent/) offer a casting set for a 5hp Stephenson reversed engine. This is a solid, tall and heavy engine not appropriate, in my opinion, for a hull under 20 feet. Elliot Bay (http://www.steamlaunch.com/) offers a casting kit for the Andserson 3 hp piston-valved single. It has a Stephenson reverse. Karl Kriegeskotte (email:carlk12@hotmail.com, no website at this time) will soon be offering a casting set for a 3” x 4” 5 hp single with a simpler version of the Stephenson reverse. Price about $1,000. He recently sent me this photo. Below are two photos of the slip eccentric mechanism on my old Reliable compound. The left hand photo shows the eccentric pin engaged for left hand rotation (ccw) and the right hand photo shows the pin engaged for right hand rotation (cw). The eccentric rotates freely on the driveshaft being restrained to 150 degrees of rotation by the eccentric “driver.” The driver is secured to the drive shaft by setscrews. There is a dowel pin in the eccentric that is “captured” by either end of the slot in the driver. In a slip eccentric mechanism the only additional part needed to reverse the engine is the driver. To reverse the engine you simply shut the throttle to stop the engine, turn the engine 150 degrees in the reverse direction to relocate the pin to the opposite end of the driver and then reopen the throttle. Since the driver is a rotating part that causes an angular shift in the timing of the eccentric it adds no noise to the normal operation of the engine. I have seen many beautiful Stephenson linked engines whose linkage noise exceeded all the other noise on the boat. 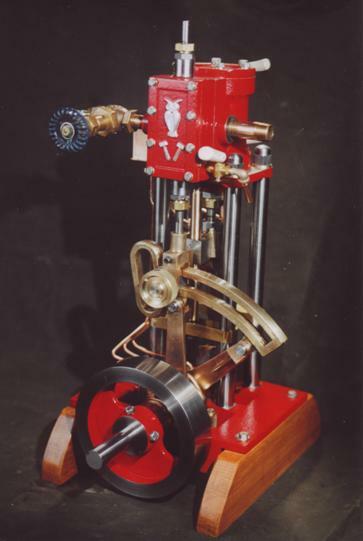 Look at the Stephenson reverse mechanisms on Carl Kriegeskotte’s or the Pearl engines above and note that there are two separate eccentrics coming off the driveshaft, one eccentric is positioned to move the “D” valve and, hence, the engine in a forward rotation and the other is positioned to run the engine in the reverse direction. 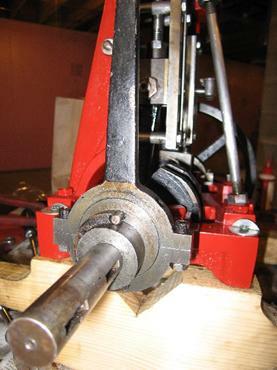 The top end of the eccentric straps (or rods) are connected to opposite ends of the slotted arc of the Stephenson link. 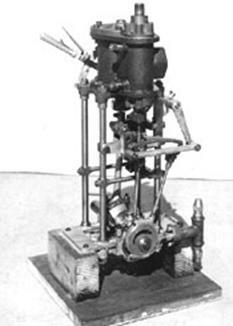 Note that one of the eccentric straps on Carl Kriegeskotte’s engine (above) is vertically positioned directly under the steam chest and the “D” valve’s actuating rod. 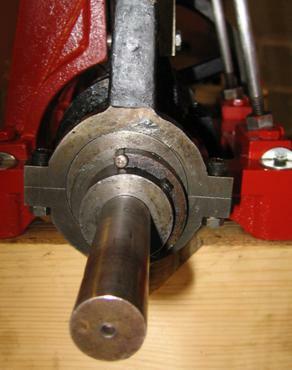 To reverse this engine the knurled knob is loosened, the grab handle (left of and behind the knob) is pulled leftwards to the opposite end of the Stephenson link and the knurled knob then retightened. This places the other eccentric rod directly under the “D” valve’s actuating rod and the engine reverses. See my main steamboating web page at www.earlmorse.org/steamboa.html to download mpg videos of two of Al Berry’s Hasbrouck-designed engines being reversed by their Stephenson mechanisms. These are large files (3 meg) so don’t download them unless your computer has a broadband connection. There is no doubt that Stephenson links are handy and convenient, as they are easily operated and allow variable cut-off, but there is a price! Most small steamboat operators feel that the Stephenson link's variable cut-off feature does not produce a significant increase in efficiency and is, therefore, of negligible fuel conservation value. Of course, you can always start with a slip eccentric reverse and later convert your engine to a Stephenson link...My guess is that you will decide, as I have, to keep the slip eccentric in your small boat.